My Grandfather Hermann Raab ( in our novel Stumbling Stone he is the character Gustaf Schmidt) was drafted into the German Army when World War I broke out. He was sent to the western front and entered France through neutral Belgium. At Verdun the war ground to a halt and the trench warfare began. My grandfather was in one of the trenches facing the French on Christmas 1914. Two things happened: He received a package from my grandmother. 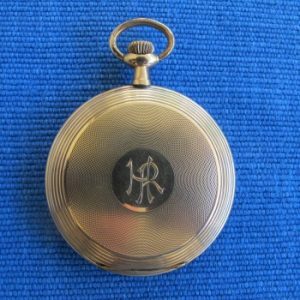 It contained a solid gold pocket watch engraved with his initials HR. The inner workings of this watch (the movement) were made in America and were intended to be a railroad conductor’s watch. These watches were extremely accurate because American trains had to be on time over very long distances. Sometime in the first few years of the 1900’s this watch movement was loaded onto a steam ship and exported to Germany. 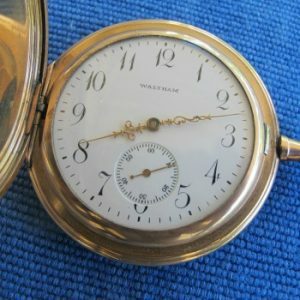 Around 1912 a German watchmaker/jeweler fashioned a solid gold case and installed the movement and the watch face into it. 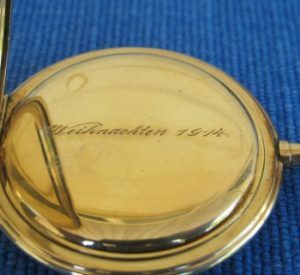 Inside the back lid was engraved “Weihnachten 1914” (Christmas 1914). My grandfather proudly put the watch into his uniform jacket. At midnight on December 24th 1914 the British, French and German soldiers stopped fighting. They left their trenches, met in the middle and celebrated Christmas together, sharing smokes, showing each other pictures of their wives and children. They sang Christmas carols together—each in his own language. Some also organized informal soccer matches. Around dawn on Christmas day their officers ordered them back into their trenches and by sun-up the warfare and dying continued. By the end of the war, my grandfather had lost his leg. He returned to Leipzig, Germany and resumed his career as a police officer. A key scene in Stumbling Stone takes place there, when Karl and Sarah find important documents that help them learn what Karl’s family did during the Nazi regime. In the late 1990’s after my grandfather and my father had died the watch became mine. I brought it with me to the United States where it waits in my bank vault for my son.